For my senior design project I built a system with a few friends to track Android phones indoors using Wi-Fi signal strength. The technique we used is called Wi-Fi fingerprinting and has been detailed in a few academic papers . 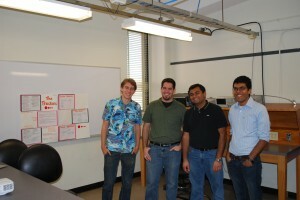 A funded startup called Wi-Fi Slam is attempting to commercialize the same concept. 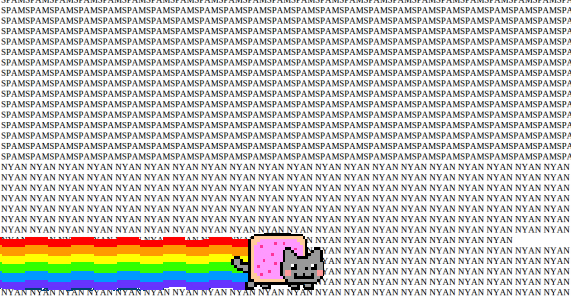 Update 3/23/2013: WifiSLAM has been bought by Apple for $20 million. There’s a lesson here somewhere. The Android app looks like this: The web app allows you to track many phones. 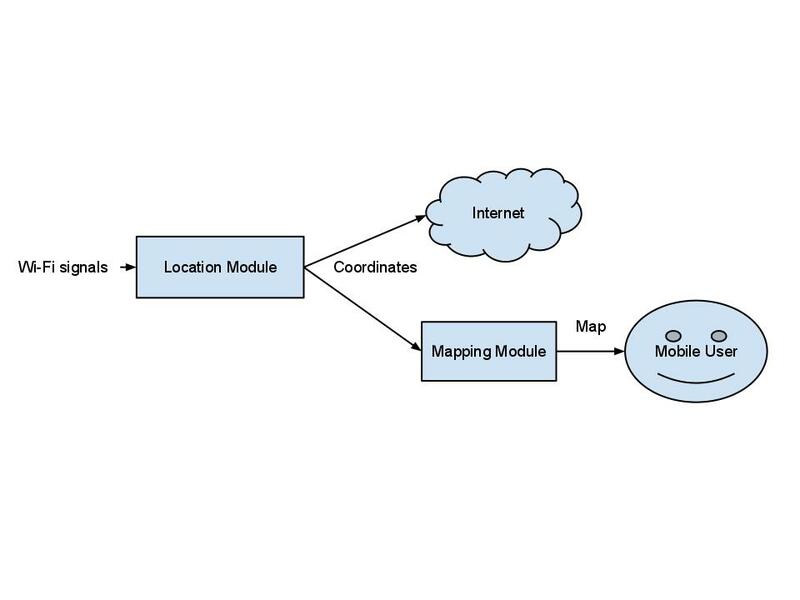 It looks like this: Source on GitHub: Remote Monitoring Application Mobile Tracking Application Mobile RSSI Recording Application “Trainer app” Disclaimer: Much of the source is a mess. I wrote the RMA and the mobile UI plotting code. Background The project is driven by the fact that GPS performs poorly indoors– the receiver chips just can’t receive reliable signals through roofs. We decided to get around this with Wi-Fi. The original specs called for a personal inertial device built on Texas Instruments hardware. However, we weren’t too keen on designing an original embedded system and the math required to coordinate a gyroscope, accelerometers and e-compass was unpalatable. Our solution is to construct a table of Wi-Fi signal strengths. 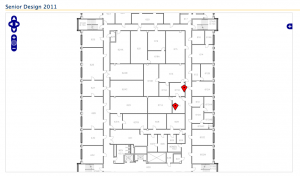 At many points inside the building, we recorded X-Y coordinates and the RSSI values from each available access point. 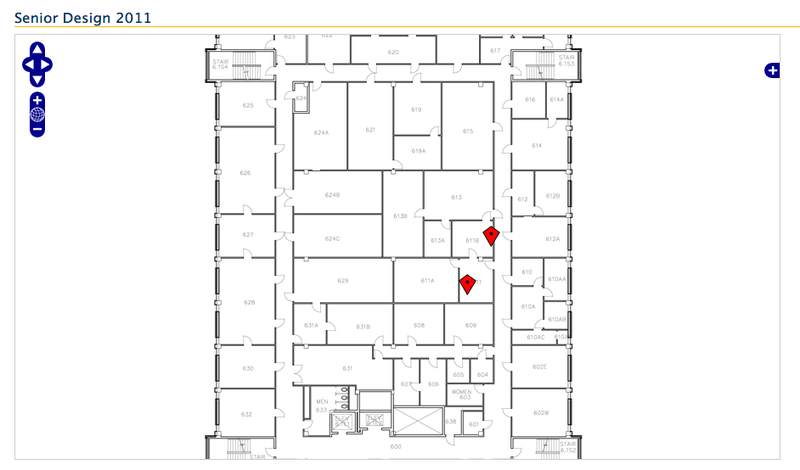 We could then perform a lookup in this table to find the nearest point and tell the user that he was at that location. The design consists of two subsystems. 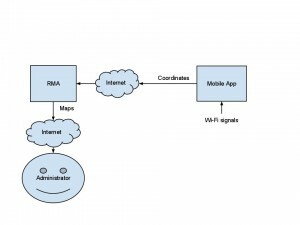 The first is an application on an Android phone, and the second is the Remote Monitoring Application that runs on a web server. The smartphone application sends real-time position information to the RMA. The system overview below enumerates the inputs and outputs of each subsystem and the interaction between them. 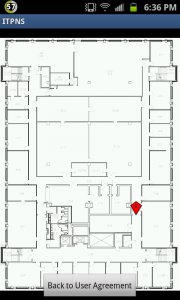 The mobile application reads Wi-Fi RSSI values and turns them into positional data. 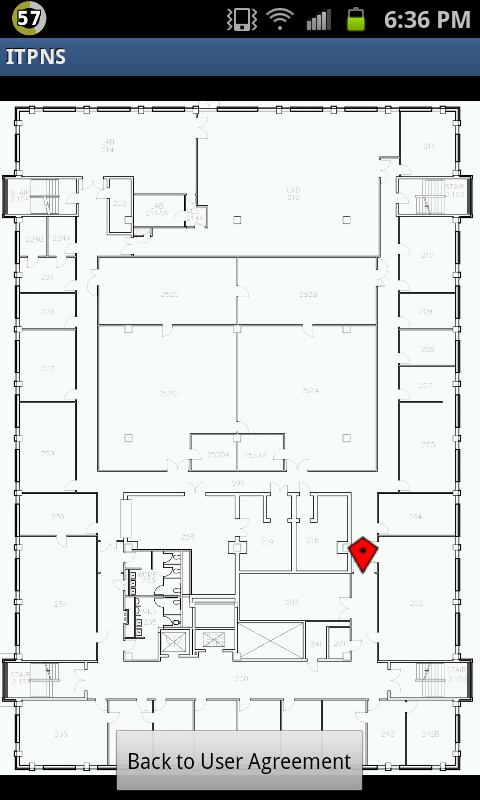 The RMA receives these coordinates and plots them on a map in the user’s browser. The mobile application is an Android binary that users run on their smartphones. It tracks the mobile phone’s changing position using Wi-Fi fingerprinting. Fingerprinting allows the application to compare current RSSI values from nearby Wi-Fi access points to previously gathered values in a table stored on the mobile device. The stored values correspond to a physical location, thereby providing an accurate position reading. 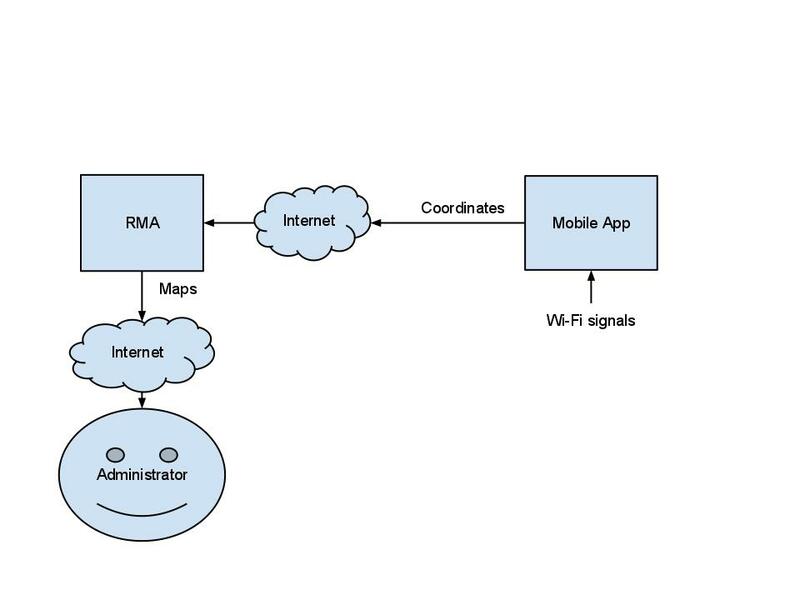 The application constantly displays its computed position on a map and relays that position to the RMA over an available Internet link (Wi-Fi). The position lookup itself is O(n * m) where n is the number of rows in the table and m is the number of access points sensed. Two nested loops compute the dot product between the current RSSI values and those in the table. The point with the minimum difference is considered to be the closest point and sent to the RMA. 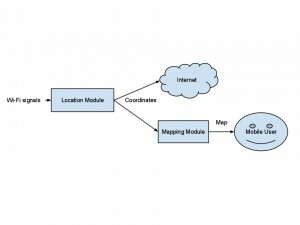 The interesting code is in Map.java in the PointWithRSSI method. Long story short, we had everything working for the open house. The accuracy was spotty– about 6 meters. It seemed to perform better in the hallway where the access points were installed rather than the rooms. Accuracy may have been improved by recording more points. In the end, it was enough to convince the professors. We ended up winning second place and taking home a modest cash prize. I wore that obnoxious shirt to troll Merwan for requesting business casual attire. It went okay. This project was more of a lesson in project management than anything technical. We had another team member not pictured above because he just didn’t show up to anything. Not even the open house. Early on we made sure his work would be limited to the wholly independent heat map component. Sure enough, it never got completed. References  http://digitalcommons.calpoly.edu/cgi/viewcontent.cgi?article=1007&context=cpesp  http://dl.acm.org/citation.cfm?id=1451884  The operation done for each BSSID column in the table is: difference += (stored RSSI) ^2 – (stored RSSI * current RSSI). After the outer loop iterates through each row, the minimum difference tells you which row has the XY coordinates you need. This makes sense, but I’m not convinced it’s actually a dot product. Parts of this post were taken from a Testing and Evaluation plan coauthored by Rohan Singhal, Tim Osborne, and Merwan Hade, and myself. I finally bit the bullet and picked up a MacBook Air. Ubuntu 11.04 had a problem with remote folders breaking after waking up from a suspend. That was the last straw. I’m fine with paying more so I can spend time hacking on web stuff instead of troubleshooting desktop issues. For all the hype, I expected a machine descended from the heavens; a laptop from the desk of Zeus. These religious aspirations for a notebook were a bit misplaced because there are a number of problems with the Air’s experience. This is not a critique of Lion, the hardware, or any one organization in particular, but a quick dialectic on the overall user experience, including third party applications. No out-of-the-box support for remote folders via SSH. Ubuntu makes this a breeze. I spent way too long following blogs to find out how to set this up. I eventually bought an app called transmit that does the job. I’m expected to pay money for a decent text editor? Notepad++ and Gedit are both fantastic and free. TextMate better be the best thing since canned bread. Homebrew depends on Xcode which is over 3 gigabytes. There isn’t a ton of space on this SSD. Have to buy $15 Thunderbolt to VGA adapter to use with my LCD screen. Sometimes the command key ⌘ functions like a Windows control key, as in copy-paste, but other times it doesn’t, like when switching through tabs in Chrome. Mail doesn’t work. Gives IMAP error when trying to log in to Gmail. Probably due to my Gmail settings, but no indication of this. When compiling stuff the fan really makes a fuss. The hot area is small, but too hot to touch. Brew fails to compile dependencies for SSHFS. Not going to troubleshoot this. When computer speakers are plugged in, I can hear very faint interference from a TV or radio station. Seriously. “Delete” key appears to do nothing in Finder. I assume this is because it’s really the backspace key. When using a USB mouse, the scrolling direction is reversed. I can change this in the settings, but then all the touchpad gestures are reversed. Boot time is unbelievable. I tried to time it but it completed before I started the timer. Terminal included, Chrome and FF easy to set up. Keepass + Dropbox work exactly the same way as they do on Windows, Linux, and my Android phone. Way to be consistent. Heat is contained to the area above the function keys. Dead silent when fan isn’t spinning. Keyboard shortcuts and gestures will save a lot of time. A number of positive things go without saying. I didn’t have to hunt down Wi-Fi or video drivers and I didn’t have to re-install the OS just to get rid of bloatware. But, for $1,343.79 I expected a little more divine intervention. On the whole, the problems listed are pretty minor. I was able to get a comfortable working environment set up in a few hours. I’ll be spending inordinate amounts of time with this machine for the next few years, so send some OSX productivity tips my way. Update 11/24/2011: Buying any other computer would have been a poor choice. I carry this machine everywhere. Keyboard shortcuts and gestures really are worthwhile; I don’t use an external mouse anymore. I’ve had the misfortune of becoming acquainted with the seedy, spammy world of affiliate marketing. This misfortune begat several web applications that generate modest amounts of revenue each month. Finding the total revenue is a chore because most marketers run campaigns from several different affiliate networks. When I want to see how much money I’m making, I don’t want to log in to three or four different sites. Most affiliate networks don’t have APIs, so earnings data must be scraped from the HTML. Any scraper must get past the login screen and navigate to the earnings page to find the earnings data. This is problematic because the sites change often, breaking the login code and string parsing used to extract the data. Additionally, networks come and go. When there are no offers worth pursuing, marketers will have no need to view the earnings from that particular network. Furthermore, not all marketers work with the same networks. Any solution must make it easy to select which networks that will be scraped. This implementation takes advantage of object orientation in PHP5. The server performs the actual scraping in PHP classes that implement the abstract Network class. These classes are responsible for determining whether or not they have retrieved good data. If earnings data is unavailable due to bad credentials or a modified source site, a JSON-encoded error response is sent back to the client. Credentials for each affiliate network are stored server side in networks.json file. Since all the earnings data lives scattered across the web on affiliate network sites and isn’t persisted on the server, it seems more efficient to cut out the PHP altogether and do everything client-side. Credentials could be saved in HTML5 localStorage. The major barrier is finding an elegant way to do cross-domain POST requests. Finally, the getEarnings method has two date parameters to let the callee select a date range. These are ignored in the three Network classes I’ve written so far. They scrape earnings for the current day no matter what. Write a class that implements the abstract Network class. Look at Cpaway.php for an example of php curl use. Send me a pull request so we can have a comprehensive earnings scraping solution. 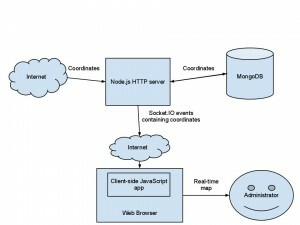 Client: jQuery runs in the browser, sending messages and polling the server for new ones. Application settings and state are maintained in the global pillowchat object. Functions beginning with “render” read state information from the global and push it into the DOM. CouchDB only stores “message” documents. They contain three properties: Username, tripcode, message, and timestamp. Each message includes a password. The server hashes this into a tripcode that allows users to identify each other without registration. Only the hashes are saved. Mouse over usernames in the chat room to see the tripcodes. Rather than create a separate document to keep track of users’ most recent activity, I just record timestamps in an empty message document. Every time the client polls for new messages, the empty message document for that client is updated with a timestamp. The getUsers function grabs a list of active users by selecting all the empty message documents with timestamps in the last 5 seconds. Since the views are predefined, you can’t change the timestamp in the request sent to CouchDB. Instead, I return all empty messages and use PHP to loop through the response, looking for the most recent. It seems like there should be a better way to do this. The app looked nice and appeared to work pretty well when I roped in some late night facebook lurkers to test it. Feeling confident in my creation, I showed it off to my neighbor @Kmobs while picking up some cookies from his apartment. The app was in no way prepared for his hordes of CyanogenMod followers. The chat appeared to work okay with about 25 people in the room, but became inaccessible almost immediately after. 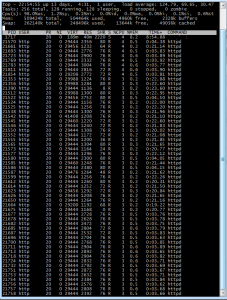 All the polling clients hammered the server, maxing out the Linode instance’s CPU and memory. It’s obvious that something with an event loop like Node.js would have been far more appropriate here. 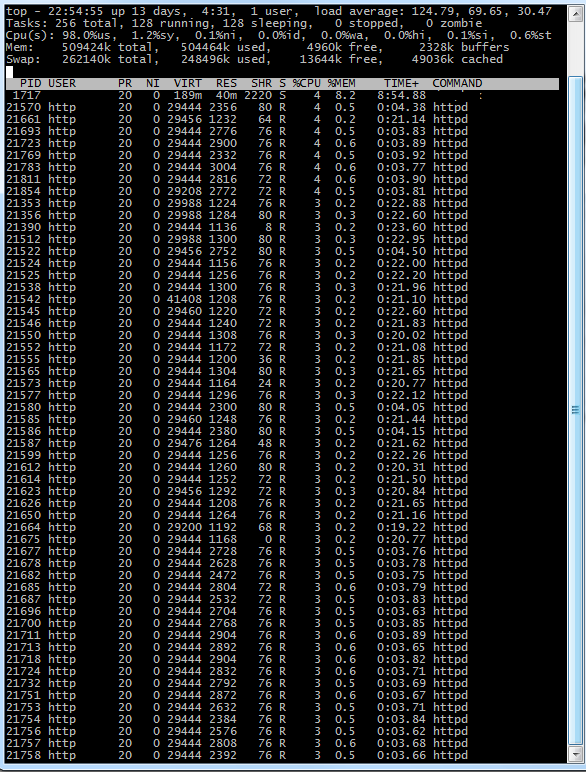 Apache’s processes quickly wiped out the RAM. There goes 1/3 of my monthly bandwidth. Linode provides some nice graphs of CPU, bandwidth, and disk IO. They all confirm that the server was swamped. I’m curious to see how a static web page or WordPress install would stand up to this kind of traffic. The trouble didn’t stop there. During the post mortem I saw that the database size had ballooned to a whopping 5.8 GB. You already know that you shouldn’t trust clients. This truism is an understatement. You should write your server side code with the assumption that your client code is being manipulated by devious bastards. 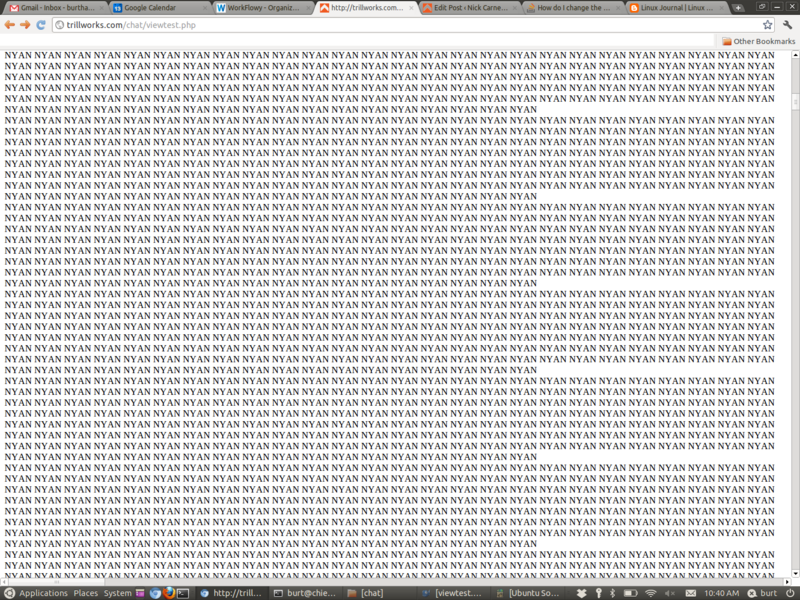 In this case, the server failed to verify message length and message frequency. Several improvements could make this app scale better. Websockets are probably better than having clients poll the server every second. When enough people join the chat, the server basically experiences a DDOS attack. Since Websockets don’t really enjoy wide support, the polling method could still be employed in a more conservative manner. Clients could reduce their poll frequency as an inverse function of active users or perform an exponential backoff when their requests time out. The PHPillow literature base is pretty small. There is a short tutorial on the official site, but it doesn’t cover very many use cases. While the API itself is decently documented, but some more examples would go a long way. When you create a view in PHPillow, it is stored to CouchDB the first time you execute the code. If you want to modify the view, you must delete the original view in Futon before the changes are stored. This is not a big deal, but it’s frustrating if you don’t know about it. Additionally, I’m not thrilled by the prospect of writing a view every time I want to construct a new type of query. CouchDB is good at selecting ranges, but it’s not immediately apparent how I should locate a document based on 2 string properties, e.g. “firstname=bob&lastname=loblaw”. The PillowChat source is available on GitHub. It would be fun to see what kind of volume is possible if the aforementioned improvements are implemented. Big thanks to Keyan and the CyanogenMod crowd for the testing. Edit: You can build a more efficient chat app with far less code using socket.io and node.js. See SocksChat for a simple example. Styling is borrowed from Jérôme Gravel-Niquet‘s backbone.js demo. I have no idea what will happen if you open the demo in Internet Explorer. I changed the name from PillowTalk to PillowChat after I realized someone else on github beat me to the pun. One of Google+’s much touted features is its ability to automatically slurp photos off of your mobile phone. I’m a big fan of this functionality. It represents a marked improvement in user experience over Facebook. It’s silly that we waste so much time dragging and dropping image files. I assume this information is pulled straight from the EXIF metadata embedded in the image file from the phone. 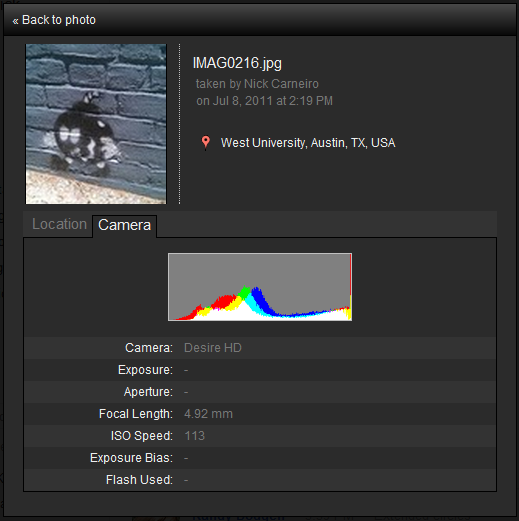 That’s handy, although I’m not really sure what I’m supposed to get out of the histogram. If you click “Location”, you’ll see something even more interesting. That’s almost exactly where I took the picture. Awesome! But very close to my apartment. Creepy! As far as I can tell, control over who sees what is a major selling point of Google+. The whole Circles concept seems like a user friendly access management system. 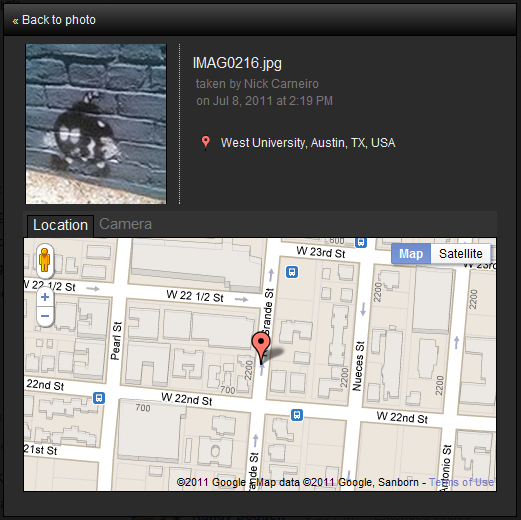 So I find it a little surprising that sharing a photo is bound, by default, to share location information as well. I know that the information was already in the EXIF data, I gave the Android application permission to access the phone’s GPS, and there was probably a warning in the terms I agreed to. But 99% of people won’t consider any of that when they share an image from a location they would like to keep private. To be clear, I think this feature is really cool. Google has taken full advantage of geotagging in a way that provides value to end users. People just need to be aware of what exactly they’re sharing.